Although you can put everything on your website, please don’t. Here are 15 things that should never go on a website, under any circumstances. Disclaimer: Some readers will disagree with this advice. These are my sincere recommendations, but ask your strategist or designer before making big changes to your site. 1. Vague Headlines …we’re the best, at what? Homepage headlines often fail to say what the business does. Instead, they offer a general statement about quality or value. The visitor’s first question is “am I in the right place?” The headline should answer this question by explicitly stating the main business category. Ironically, the “what we do” information is usually just below the headline in smaller text. The header “Experience Excellence” is vague. 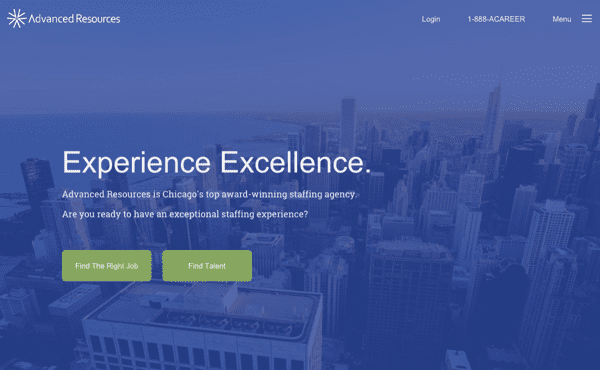 But the text below “award-winning staffing agency” is much more descriptive. Flip the header and subheader if your headline is vague, but the text below is specific. Make the headline text descriptive, so every visitor can tell what you do, at a glance, within seconds. Show your site to a stranger. Count to five then turn off the screen. Now ask them “what did you recall?” If they don’t know what you do, your headline is too vague. You just failed the Five Second Test. Usability Hub has created a Five Second Test website, and your first test is free. Give it a shot! Also, use this checklist of 19 Things To Put On Your Home Page. You should have most of those included. Social media traffic is great, but only if it’s flowing toward you. When visitors leave your site and go to a social network, that doesn’t help you meet your goals. They are unlikely to return. Where there’s traffic, there’s hope. A visitor on your site may subscribe or become a lead. A visitor on YouTube is more likely to watch videos of dogs looking guilty. Surprisingly, 26% of top marketing sites put social icons in their headers. Facebook is worth $300 billion. You need the visitors more than they do. Change the color of the icons so they are not so visually prominent. If you show the color, do so on the rollover. If I removed that header, would it confuse visitors? If the answer is no, then the headers are not meaningful. It’s adding visual noise, not value. Write descriptive headers for sections. Or just remove the header completely, making the items in the section more prominent. If your content strategy is like mine, you write and share helpful, how-to articles that are useful to your audience …and they don’t go out of style. These articles are “evergreen.” They time travel well. They’ll be just as helpful in a month or a year. So why add the date? Adding dates to the blog design or in headlines just makes the content look old later on. If it’s not relevant, why show your age? Great little post from our friends who make custom buttons over at Busy Beaver! But it’s timeless so why add the year? 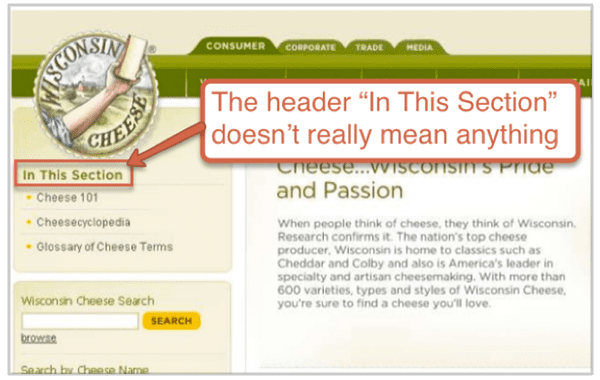 Remove the date stamp from your blog posts! Make sure that the date doesn’t appear in URLs or in headlines either. It’s very easy to embed a YouTube video into your website. But be careful. When the video ends, YouTube may suggest other totally unrelated videos. 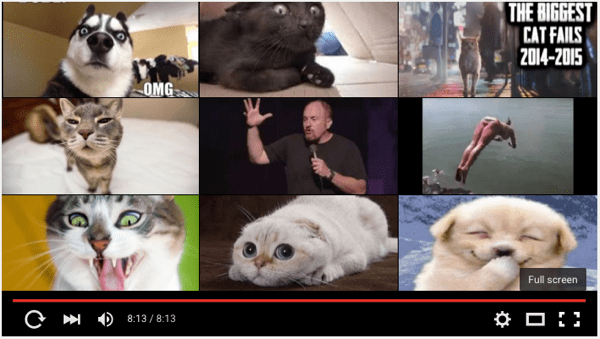 Are visitors watching cat videos on your site? While watching the video in YouTube, click the “share” button under the video. Cats are bad, but I’ve seen worse. Suggested videos may actually promote a competitor. That’s both embarrassing and counter-productive. Some visitors read. All visitors scan. Short paragraphs are one of the best ways to make your content scannable. Compare these two pages. The page with the shorter paragraphs is far more likely to keep the visitor. Never write a paragraph longer than three or four lines. Add other formatting to make your content more scannable: bullets, bolding, internal links, etc. If it helps, use our content checklist. People pictures are powerful because faces are so compelling. From the time we are infants, we gaze at faces more than any other type of images. Every website should have pictures of people. But visitors can smell a stock image a mile away. And stock images of people are the worst kind. They just don’t feel genuine. Perfect lighting. Spotless office. Ethnically diverse. Casual, but serious. Obviously not real. Invest a bit in photography. Dress up for picture day. No budget? Take a selfie. Authentic is more important than polished. A press release is not a blog post. It’s not educational or entertaining. It’s an announcement, specifically designed for members of the press. What percentage of your visitors are journalists? For most sites, it’s probably around .01%. It makes you wonder why so many sites have “press” in the main navigation. How much effort would it take to turn the press release into a nice piece of content? Does it really need to say “for immediate release?” Do you need to have the company info at the bottom? If it’s on your site, why does it link to your site. 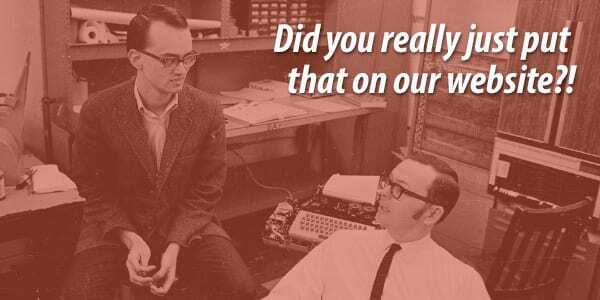 Is this your best effort to publish good web content? 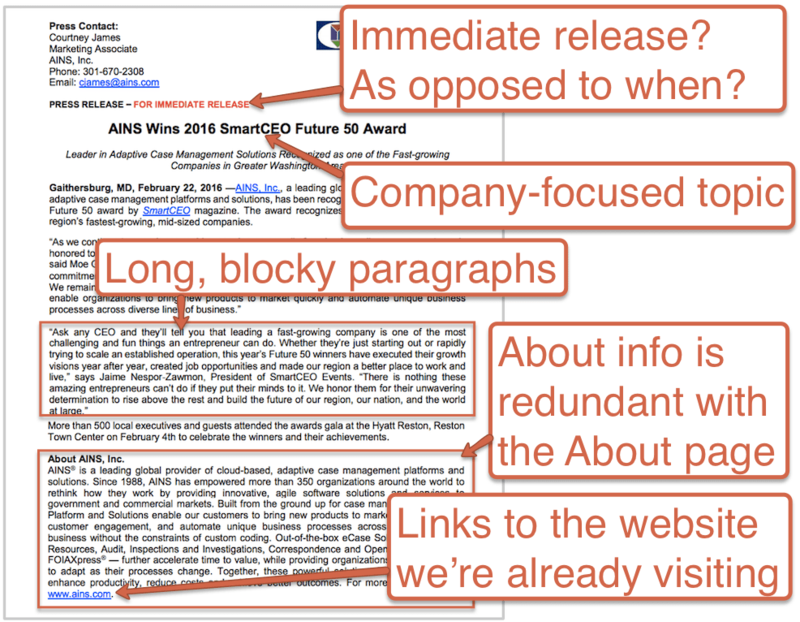 Do you expect your visitors to find your press release compelling? Research suggests that they won’t. 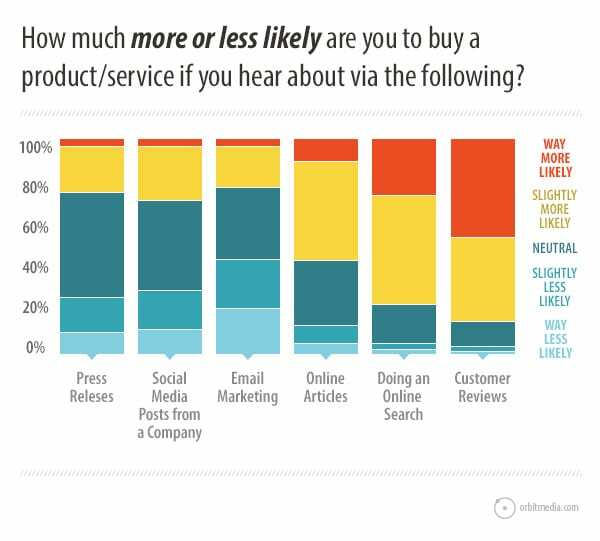 This study shows them to be one of the least persuasive things you can put on your site. On the other hand, if the media frequently requests information, your website can help. Create a digital press kit with images, downloads and anything else they are asking for. This makes perfect sense, since it solves a problem. Formatting: subheaders, bulleted lists, bolding, italics, etc. Many of you may disagree, but hear me out. 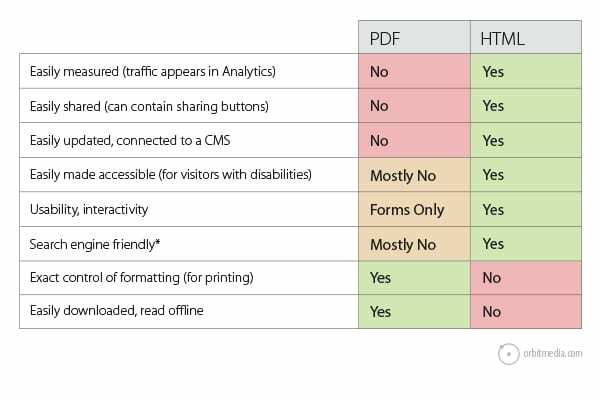 Here’s rundown of pros and cons for PDF files and HTML webpages. *It’s true that PDFs often rank, but usually it’s by accident. No serious search optimizer would recommend targeting a competitive phrase with a PDF file. PDF files are easy to create and upload, so they are an easy fix for content management when sites are hard to update. That’s why I call them rust. Don’t get me started on Word Docs. They’re even worse! It’s a PDF file that can contain viruses. Does your site have a PDF problem? Here’s how to check for rust. Search Google for “site:webaddress.com PDF” and you’ll see a count. Tip! Want to see how many HTML pages a website has? Just do the same search with -PDF, so search for “site:webaddress.com -PDF” and Google will show you the page count. All content should be HTML pages. Use PDFs as an alternate version when information is likely to be printed or downloaded. We’ve all conditioned ourselves to look away from ads. If it looks like an ad, we ignore it. 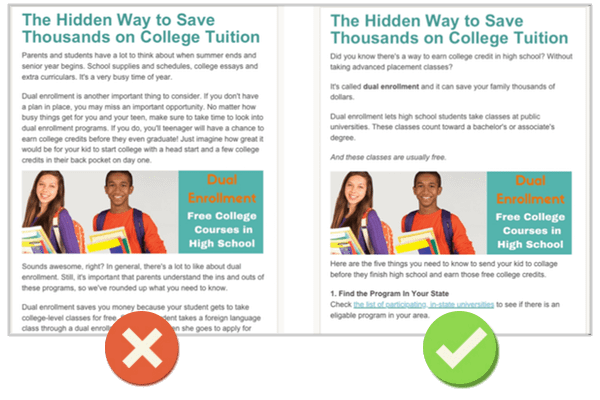 It’s called “banner blindness.” But many website owners still put banner ads for themselves on their websites. It’s the worst way to get visitors’ attention. The trend on media sites is to use “native advertisements” which are paid ads disguised to look like content. They’re very effective because they don’t look like ads. But a banner ad for yourself on your site is truly native, but you disguised it to look like an ad. That’s the opposite of good marketing. Promote your content within your content, native advertising style. Add simple, text-based calls-to-action at the bottom of every page. Testimonials are “social proof” which is a key aspect of web design and neuromarketing. Smart marketers support every marketing claim with evidence. But this evidence should be close to the claim, which makes it visible and keeps it in context. If it’s far away (on a separate page) and out of context (not specific to any claim) then it’s weak social proof. These pages rarely get visited. Just check your Analytics. Add testimonials to every page of the site! Especially when the quote is relevant to the marketing claim. When a visitor gets in touch, you get an email. But was the email sent from a contact form? Or just an email link? The winner here is obvious. 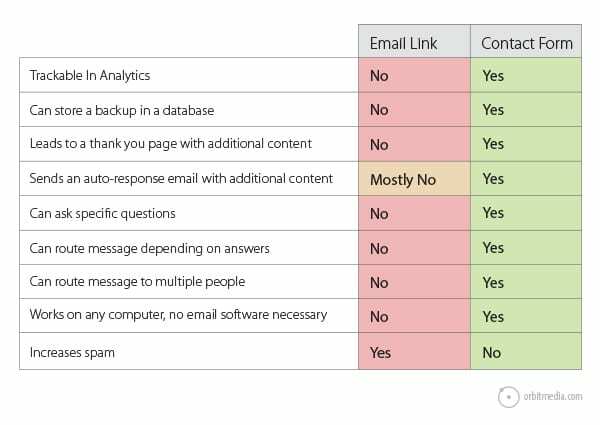 Email links fail on every criterion for good marketing, from messaging to routing, from usability to tracking. Beyond that, email links are spam magnets. Spammers use robots that scrape the web for email addresses. So that email link on your website is filling up your spam folder. Make sure your CMS saves a backup of every submission. Email doesn’t always get through! The more you ask for, the less you’ll receive. A “greedy form” is a form that asks the visitors for more information that they think they should provide. 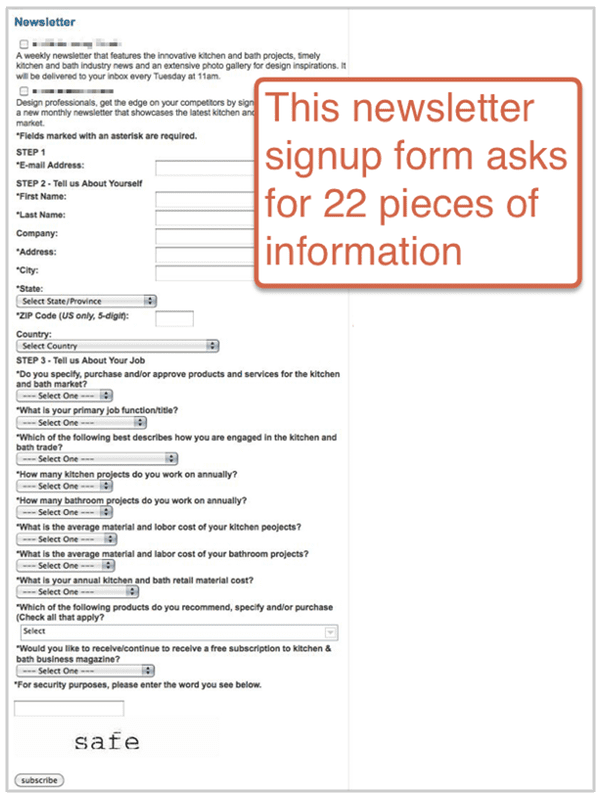 Example: this form wants you to answer 22 questions to subscribe to a newsletter. 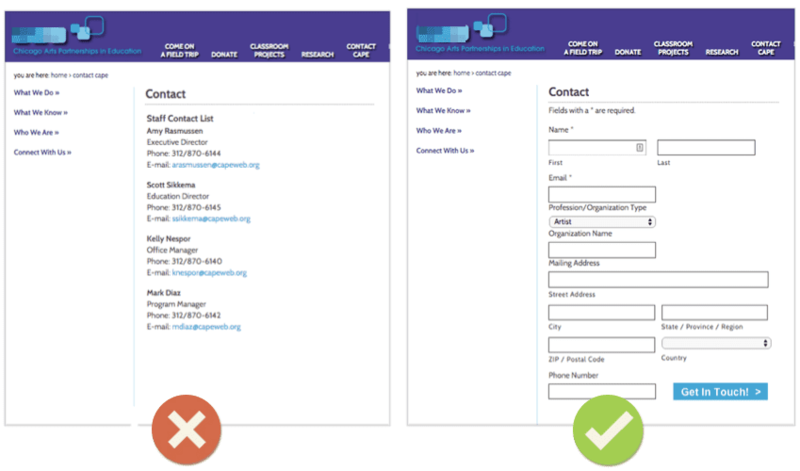 The rule of thumb for conversion optimization: more form fields means a lower conversion rate. Ask for only basic contact information, or the minimum information needed to direct and respond to the lead. Ask additional questions over phone or email when you follow up. The words in that button matter. Just look at these examples from Michael’s research. The more descriptive the CTA, the higher the conversion rate. “Submit” says nothing. Highlight the benefit to the visitor in the CTA. Use first person voice and descriptive action words. If your thank you page has just two lonely little words at the top and nothing else, it might as well say “good bye.” Right at the peak of their interest, just after they convert …you give them nothing. But if the thank you page offers the visitor a subsequent action, they’re likely to take it. There is a small newsletter signup form on the thank you page on this website. People subscribe to the newsletter on that page almost every day, adding hundreds of subscribers per year to our email list. Give the visitor another subsequent action. Find and fix every dead end on your website and keep visitors flowing. I’m sure there are a few more bad ideas we could have included here. What else? Want to defend any of the features we added here? Was I totally wrong about anything? Ok, I’m ready. Leave your own rants and input in the comments below. You would hope this goes without saying, but we still see a lot of animated intro pages. Besides being SEO death, their loading time, irrelevance on mobile, and UX consequences make them something I would add to your pretty great list. Two pet peeves from the post for me Andy..
Second, social buttons…love you called them ‘Candy-colored Exit Signs’….so true. Good stuff, as always. Nice job my friend. Not sure why your fellow ‘Orbiteers’ would disagree with these. Thanks for chiming in, Mark! Yes, it’s amazing to me how many sites put big, colorful social icons in their headers. Often, they go to social networks with no activity. Isn’t that obviously crazy?? Maybe common sense isn’t so common. Glad you liked this one, Mark. Great to see you here, and it was great seeing you at Content Jam! It’s refreshing to read some common sense about web-design. The only one I disagree with is PDFs. They have a predictable size so are easily printable. Many other print options have variable print output from one site to another, maybe variable output one item to another in the same site. So a PDF menu is a good thing ! Great list, Andy! I am definitely on board with these! Amen to the press releases point Andy! Nothing is sadder to me than a long list of press releases. What a press release on a site typically says to me: No one thought this release was interesting enough to write an story about it. A bit disagree about the sharing buttons because I actually use them to follow sites in 2 clicks. I would add the new unfriendly CTA – the Full Screen welcome sign-up. It’s disturbing and postponing the user from getting into what he wanted – the actual page. I’m not surprised to hear a dissenting voice here. But here’s the counter-point: if you want your visitors to follow you, you can let them do that without having them leave the site. They can follow with one click, not two! Thanks, Andy. Just reviewed my site for these elements. How do you feel about testimonials, Andy? Some clients still insist on them, but I think their time has long passed. I feel you Dawn with Testimonials. It’s clunky. But when speaking with big brands on the phone they are looking for testimonials and additional credibility signs. A possible solution is to have a page of testimonials but link it in the footer (or elsewhere, just not in the header). Actually, I love testimonials. I feel strongly that every marketing claim should be supported by evidence, and testimonials are a great way to do it. So I recommend adding them everywhere …except on a testimonials page. Visitors tend not to visit testimonials pages. Just check the Analytics. This also takes them out of context. This is actually the worst place to put them. For a race I organize, we splash the page with testimonials, mainly because runners are a finicky lot, and we have reviews from nationally respected runners and writers. I think the key is WHO you can attribute the testimonial to. Yes! Testimonials are a great credibility builder BUT to Dawn’s point, they are becoming overused to the point of being ignored. Today I tell my clients to combat “testimonial fatigue” by insisting on using full names, photos and/or video. They also need to be specific and concrete. No “They’re greats!” allowed. Instead, focus on telling a personal anecdote around the product/service. 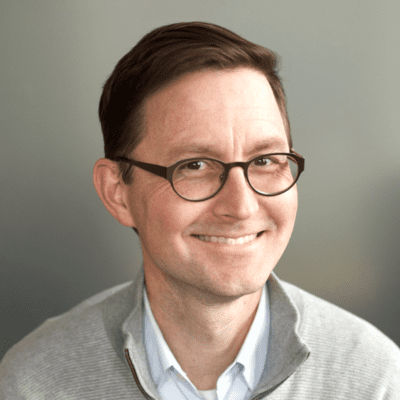 To your point Andy, instead of testimonial pages, we’ve begun using terms like “Case Studies”, “Customer Stories”, and even “Product Reviews” to attract more eyeballs to the “Testimonials”, whether that be on a pull-quote, sidebar, separate page, or blog post. This is good advice! Thank you!! We are in the process of redesign on our website and looking for hints to make it better. I’m in your camp on the contact form, but my client wants the form plus a generic contact email address because some users prefer to send an email directly—and to not provide personal info like their name. I’d like to use metrics to demonstrate the value of the form. Given the choice, however, I suspect most users will choose the quicker link to an email rather than use the form. Thus the metrics will appear to validate inclusion of a direct link. I may have to track an increase in spam as the compelling metric! I would try to talk them out of those email links at any cost. They’re just nowhere near as good at meeting goals! But you might still be able to measure the conversions if you setup event tracking. Let em know how it goes, Thom! The email form is my one quibble with this article. As a reporter, I never fill them out, because it can take several days to get a reply – if you ever get one – and my deadline has passed by the time I hear back. I move on to the next possible source. I see the risk of spam, but it has never become much of an issue on the sites I manage (events sites, for the most part), and by giving users a simple email (some are still intimidated by forms) I can answer their event or registration questions immediately. It improves our service and makes them more likely to register, rather than waiting a couple days for the right person to get the email forwarded to them. Question with the email links vs. forms section; Would having your email address without the link be as bad as linked? I know that personally, I get super irritated when there is a form I have to fill out and I always hunt for their direct email address. On my own site, I want to provide both options, but I’m curious how you feel about them being able to copy/paste it as opposed to clicking the link. Is there a difference? I would disagree with the email form as I will never fill one out unless I have to, without any alternative option. I would have to be very excited about the product to do so. My reasons are simple. If I click on an email link, I am sending an email to a specific entity, while filling out a contact form puts ~MY email in some list without any insight or control from me. I would end up on email chains and spam lists for promotions, which was not the reason I wanted to contact XYZ in the first place. We are always learning and looking to continuously improve at Advanced Resources – – – we appreciated Andy’s feedback. Thanks! Andy, on #6, I think it depends on the business. When we advise our dental practice clients, my recommendation is to get them OFF the website as soon as possible and to get them ON to their social platforms because that is where they really see the culture and vibe of the dental practice. I think it leads prospective new patients to take action better than looking at their antiquated, “snapshot-in-time” website. So, your advice is only good if the objective is to keep them on the website. That is not always the objective. Great post, as always. Thanks. Thank you for the thoughtful reply, Jack. Yes, this is the question. Where are they most likely to see who we really are? Where are they most likely to take the desired action? If this is on a social network, they I suppose your goal is to set them away. I guess a bounce is a success? It goes against my experience, my gut and my Analytics. But in this case, it could make sense. If sending visitors to FB is the best path to making the phone ring and the door swing, despite the fact that it’s filled with distractions, irrelevant ads and competitors, then get them there ASAP! Fantastic pieces of advice, Andy, every one. Similar to the music point, what do you think about auto-play video? Personally, it’s something I detest, but from a marketing perspective is it effective? Why would adding a vcard function to a persons contat information be a bad idea? I think it would give an extra service, for people visiting a site and looking for an employee. Downloading his contactinformation to eg. Outlook ore any other addressbook wold offer an good service, especially if you have a big site like eg. a govermental institution with many employees. It’s not necessarily a bad thing, but that doesn’t mean it’s a good thing. I agree that for certain industries, it may be practical. I know that Outlook is popular in the professional services, like legal. But unless you know that it is a valuable feature, I’d resist adding it. Everything you add to a page adds visual noise, pulling attention away from other important (revenue generating) calls-to-action. Just because it doesn’t hurt, doesn’t mean it helps! Hmm. Came here to ask this because I was searching for reasons why vCards had not been widely adopted. To be fair, I’m talking about restaurants, tourist spots, venues, Top 10 lists, concerts, and review sites. If I go to Yelp! and I see a list of the best Indian restaurants in town, I can either “send to my phone” which forces me to cut and paste each field of each entry (= time consuming and error prone) or I can type the name, number, address, city, state, zip code, hours of operation, type of food, and notes about why I wanted to eat there in by hand. My phone will literally tell me when I’m within spitting distance of a restaurant I want to visit. So for a website like Yelp! or a local color magazine to not employ such a format seems ridiculous to me. What are your thoughts on why this format has not been widely embraced? What can be done to change this? Thanks Lisa! I expected a few people to disagree with the press release point, but so far, no one has jumped in …except for Susie Silver. Did you see her comment above? I love it! Really some things we should think about. Never thought about PDFs in that way. I wouldn’t kill all – but a lot are not necessary to be in a pdf (addition – internal links in a PDF???? – No link juice). Thanks Andy. Finding this advice just as I’m designing a website, so perfect timing. It all makes a lot of sense! Great post Andy! I have never been a fan of QR Codes to be honest, and I totally agree with the whole music playing in the background, even 7 years ago when it was really popular, well, I avoided it like the plague. Great suggestions. Please do include a phone number and an address, even a P.O. box, so I know you’re real and where you are (i.e. U.S., Australia or Timbuktu). I couldn’t agree more, you shouldn’t make a vague header, be specific. Or else, readers would not be convinced enough to click. Who would want to dig deeper just to know every detail of what you do, visitors are really more concerned about accomplishing their goals and making them click deeper for basic info would not be considered helpful. I’m one of those people who love to see photos on a website (but real and genuine looking photos) than simply reading through the content. All tips are showing right direction. Thanks for sharing great article with us. Seriously though flash/shockwave should be on here! Funny you should mention RSS buttons – I was just looking for one! I love your content but (honestly) your twitter posting is too often for my tastes. I wanted to add your RSS feed to my feed reader and it doesn’t look like you have one. Great post! And I definitely agree about the music. Nothing will chase me off a website faster than having music suddenly blast out at me. I can’t believe that companies still do this. So obvious, but we still seem to miss this. Thanks for the guidance Andy. Keep it coming. Great points, Andy. 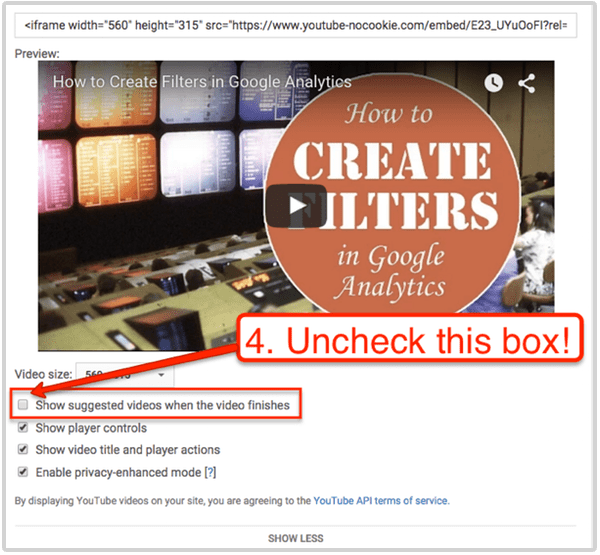 I learned a few new things – especially liked the instruction about YouTube videos (#5). Thanks…. I would add: “home” buttons in menus. They are useless (you can always click on logos), and pointless (you should make your customer go to the money pages, not the home page). Great post Andy and agree fully with your points. Social media icons at the top is interesting and I completely agree that they unfortunately provide a quick exit from your site, however there us nothing easier for a visitor than clicking a Twitter follow button and then you are in their information feed – isn’t this preferable to no engagement if they can’t be bothered with your contact form or newsletter? I myself tend to follow both my customers and suppliers via social media rather than by any mechanism on their website. In those reputed 5 key visitor seconds on the homepage if your onsite engagements fail with that visitor then at least there is a valid victory in them seeing that you are on social media and impulsively following you – no visible social media icons might mean more visitors leaving with no engagement? Also does following a company of interest on social media feel less of a commitment for some visitors than signing up for newsletters etc and surrendering your email address and other information? Absolutely laughing about the PDF=Internet rust comment! So true! Just found your site through Hubspot. I love your insight Andy. Thanks for the eye opening article. Got to deal with some of those. Is there a study that shows why artists and restaurants seem to be the main violators of auto-play music? What do you feel about animated intro videos? some of the feedback here is that it’s not another item to add to the list above. Knowing it’s disadvantages in terms of SEO and Mobile, there is the element of capturing your audience as soon as they go on the webpage and the ability to present a message/brand in short relative time. Great post! Must check out your things to include post now! I couldn’t agree more with these although I do disagree with email. For me email adds a personal touch. I’m much more likely to contact someone if I can easily copy and paste their address into my composer. For me I can ensure formating is how I want to be perceived, I retain record of my communication and for somereason I feel like it’s more personal than interacting with a webpage. For me, I take the hit on spam to let my clients use my site as they wish. Anyway, great post and I look forward to reading more. Can you menton – update the post on Home page sliders with details.Would like to learn. I’ve heard conflicting arguments on the presence of a Vcard. Many love the convenience it offers to those who want to save contact information. Does it have security flaws similar to those created by the presence of an email address? What’s wrong with homepage sliders? I left this in another comment in case you missed it! I have the same question. What’s wrong with Home page sliders? i) (If auto) many people find ANY motion distracting, annoying and a reason to leave. ii) They likely fill the initial view so reducing other content. Didn’t know about the YouTube video trick. Will try from now on. Thanks for sharing. Do you know of any websites currently applying the HTML vs PDF concept? I’d like to submit a proposal around it and would like a good example. Those suggestions really make sense to some extent, Thanks for sharing your ideas. Thanks for the tips, but I was wondering: what’s the bad side of homepage sliders? Andy, I LOVED this. I can’t wait to share it with my other business owner friends. One comment about #12. I recently decided to counter quote the printing on a quarterly pub I manage. I did not have a contact name/number at one of the firms I wanted a quote from…and they did not have a phone # anywhere on their site! They did have a submit form…so I let them know I needed a quote. They did not get back to me for nearly 2 weeks…by which time, my decision was made. I think it is important to provide a means for people to get a hold of someone in the business if their inquiry is time sensitive. I completely agree, Linda. Just having a phone number can improve your conversion rate! It’s so frustrating for visitors to not include on the contact page. It run counter to everything that good marketing is about! Genius blog, Andy. Thanks for all the great tips! We’re implementing several right away. I definitely disagree with not having social media icons in the top right. Sure, you are sending visitors away from you site, but for most browsers, the top right is where you close a page. It’s giving a last chance to engage. You should always have the social media pages open in a new tab so the site is easily referenced again. Agree about not having any icons you aren’t active on. However when you’re visiting a brand’s website, you may want to immediately engage and having to hunt around for how to find them via social media is annoying; especially with nearly 70% of user traffic coming from mobile devices. I also disagree with not having an RSS feed. I love aggregating content and having a quick, direct way to do so is huge. If I can’t figure out how to view a blog’s newest content quickly, I guess I don’t need to share their information. Overall, great thoughts. Thanks for sharing! First of all, I learned something with the PDF search which is awesome. Because i HATE PDFs on websites. But I was surprised to see timestamp on this list. I think the date is important – especially for the non-evergreen topics such as timely or trendy pieces. So do you just not put the timestamp on certain posts? n fact, I often check when a post was published just to make sure I’m reading something current. Disagree with the article on timestamps – as a reader I consider them to be very important. I absolutely hate it when I’m looking at a post & can’t tell if it’s recent enough to bother paying attention to it. If I have to dig into the article to only later realize that it’s information is out of date & useless to me, you just royally pissed me off and wasted my time. And if as an author you’re doing so thinking that your writing is “timeless”, then you need to get over yourself. Nothing is timeless. Everything goes out of date eventually. Consider it an added impetus to keep yourself posting new & fresh (and still relevant) content. I agree on the date (having it). I’m strongly inclined to pick articles with dates in a google search (and pass over the ones without). That said, I’m also usually looking for more current dates, so older articles get less preference. So, it’s kind of a toss-up… I’m skipping older dates AND articles without dates. But, I think I’m intuitively also worrying about the date less when it is an evergreen subject, but still am more likely to skip the date-less ones. If more people are like me, having a date is a good thing, even for evergreen content. If it’s good evergreen content, I won’t care if it was written in 2006 or 2016. Great stuff Andy. Thanks so much for getting these ideas out there. Just in the process of tweaking my site now, so it’s spot on timing. Great post, Andy. I assume, there is plenty of changes I can do on my website based on the suggestions here. Loved all the points, but mostly the doing away with vague headlines on the site and long paragraphs. Both can equally repel a visitor. Time to A/B test everything. When I don’t see a date on a blog post, I immediately move on. I want to make sure the information I’m getting is up to date. Loved this post! I have a question, though. In point #15 you talk about Thank You pages and say that people can sign up on your Thank YOu page. But… haven’t they just signed up to arrive on this page? What I’ve done on my Thank You page is to add some links with image to some of our top post to lead readers deep into the site. But, I do have to disagree with the dates. We wish we were publishing evergreen content, but it’s simply not true and whenever I’m looking for info, the date is one of the first thing I’m checking to make sure what I’m about to read is accurate and up-to-date. If I can’t see the date, I’ll go back to SERP to check for another answer. Great, Andy! I am definitely on board with these! Fun stuff! as you mentioned in email. Its really helpful.. Awesome hints. We will definitely integrate most of them. Thanks!! Awesome list! PDFs = rust of the internet. Love it. This is a great article. Thank you. But I have two questions. First, a form of contact. It’s sad, but when customers see the form they know that the answer is not bee. The second question is about the banner. There is a positive experience when the company gave another banner to your site. For example, the company is engaged in a decorative stone, but also finished products. In marketing, we rarely have simple tasks. For example, our company has been developing extensions. Except for one extension we can offer the customer several submodules and other extensions to he`s online store. Although banners are not always the best solution, but possible. Is not it? Hi Andy, Great post. Really liked the YouTube option. I will replace my videos with new codes, right now! Great points. However, I disagree with (1) removing the timestamp (I always check the date, and lack of one inspires distrust) and (2) a form instead of contact info (I may just want a phone number or email, not submit a form). Thank you for the time you took to write about ways to fix things. I am in the process of re launching a blog and will be using your article as a check list of what not to do! Is there any data or study that supports or goes against any of this? Or both? Great tips, Andy! Another spectacular piece of content. #7 Stock Photos of People …stranger danger – is hilarious. That literally had me laughing out loud. The testimonials tip and the dead thank you pages are tips I’m going to implement right away. Thank you! This was so good, I am going to share this with my exclusive community. I noticed you didn’t talk about the layout of the website much. Would you add another tip or two about user experience that people should avoid? Like too many navigation pages in the main menu or making people aware there is more on the home page than what is above the fold? I’m so glad to have found yet another community, and company, of people who are really focused on fixing the way we design and market. I think in the past there has been so much focus on pretty skumorphism, and flashy graphics and animations; while the content was getting shoved to the bottom of the priority list. All of these tips really help bring focus back to what matters, strategic goals and supporting content. I agree with a few but not all of these. What’s surprising is the sanctimonious tone…kinda funny considering the comment divs on this page are overflowing from their parent element on mobile. A few other things to remove from websites. b) show that navigation is going to be clear and easy. Again this indicates either that there is nothing much of interest – or more likely that content has been hidden, requiring “work” to reveal it. Why??? Infinite scroll should be consigned to the dustbin as being impossible to orientate oneself within the page – and finding an element upon return. Links to pages are so much better – precise and predictable. No webpage should be longer than (say) pressing page down 4 times. Most should be no longer than 2 presses. If an article has merit in its length, then paginate it. 19. Grey text / White background. So either make the text black or darken the background with a pale grey or pastel colour. This problem of glare is multiplied with 17. Empty Space. 21. Monotone slabs for active links…. … that can be confused with a passive text header in a coloured panel. What’s wrong with traditional visual clues to distinguish active links from passive elements? e.g. rounded, coloured, shaded tabs or buttons – with a 3D shadow to raise them of the page. Mostly these are at best ambiguous (taking seconds to understand) or meaningless. Multicoloured icons, with shadow and depth can be much clearer. Great stuff here! Just working on updating and tweaking my website. Perfect timing. link to a “really quick” video that is 45 min. long!! I hate it. This article was great. Really love your stuff! Just wow. 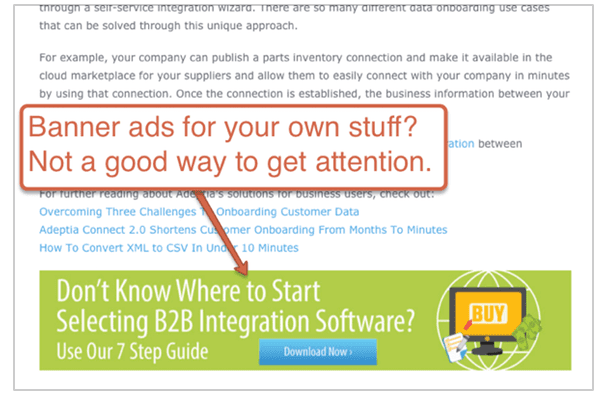 After reading one of your articles I looked at my Testimonial page and it is my 7th most visited page… could be because I named it “Taste Tests” and have videos of people trying our product mixed in with Testimonials. Definitely working at adding testimonials to every page on my site this week. This was a great read. The only thing I would eliminate on the list is to “remove blog post dates.” As an avid internet reader, current is important to me. I am always irritated by blogs that don’t post dates. We’re in an age in which things change quickly. If I can’t assess the date of a post, I automatically assume it’s old and move on. That being said, I agree with you. It irritates me to no end when ANY internet content doesn’t have a clear date stamp. It’s disrespectful to the reader. And no one can see into the future to know that what they post will never become outdated. If a blog post doesn’t have a date on it, I’ll look at the comments to get a feel for when it was written. If THAT doesn’t work, then I do what you suggest – assume it’s too old and move on. On point. Thanks for sharing! I don’t think you can paint every use case with the same brush. As has been mentioned, some people simply prefer clicking an email link to completing a form. It’s pretty easy to obfuscate email addresses from HTML to beat the bots. Like most things, it pays to run tests before making assumptions. At the end of the day it’s about providing the path of least resistance for the customer, right? From our own experience we get more inquiries from emailers than form fillers. But what’s even more popular is the online chat widget we have on the site. I believe you’ve nailed everything that really gets under my skin as I go down the Internet rabbit hole… I mean, as I do vital Internet research. Yeah. The myths can be stubborn. This article does a fine job of debunking a few. Another great and highly article form your company. Could you give examples of “native advertisements” which are paid ads disguised to look like content? In the process of a complete make over for a website – by far the best article I’ve come across for not only pointing out the issue but also offering advice on the fix. Changes made! When in fact NOW after reading it (because there was no date), I’m so glad you did email it to me, as the content is still relevant and very very helpful. An intriguing read Andy, we’re in the early stages of re-doing our company website (graphic design firm) and will certainly be viewing this list as “best practice options”. Obviously, our services are mainly focused on visual integrity, it’s easy to overlook what’s really working out there! Much appreciated! I agree with the PDFs, stock images especially. I hate links that lead to a PDF because I then have to think about how important the information is to me such that I need to deal with a random file on my computer. Restaurants do that a lot with their menus and I typically just leave. HOWEVER! I disagree with not putting timestamps. 1. It was disappointing to get the email about this post, read through it and see that there are already 119 comments … oh … the top comment was from 2015. In some ways I feel tricked. Even cable television will say a show is a repeat from 1977. 2. It helps to know if a site is still active. Maybe I’d bookmark a site instead of foolishly subscribing to it. For that reason I actively look for dates. It’s not nice to find out the dates might have been deliberately hidden. b) It is printable ready formatted. Menus in web pages are often poorly spaced – esp. if designed for mobile phones. Excellent article! Thanks for all the helpful tips. The only one I would tend to be on the fence about Is #7 with the stock photos. Unfortunately a lot of us don’t have time to take our own photography so I think in a lot of cases we do end up using stock photos but as long we are choosy and use professional ones I think it’s OK at least some of the time. Ethnically diverse is obviously not real? LOL ok. Looks around at my ethnically diverse coworkers, we’re not real guys! Bad choice of an example, but other than that line, solid points. I completely disagree with removing the date stamp. Take this blog, for example, which, according to the comment dates, was posted at least three years ago. Web standards, Google standards and overall “best practices” for websites are changing constantly and vary wildly from when you posted this. Your post is out of date, and without a date stamp, I can’t even tell if it is relevant to my specific needs. I typically leave any website without a date stamp as soon as I get there, because I have no way of knowing if the content I’m looking at is still credible. Even “evergreen” content goes out of date. I stopped reading at that recommendation and the only reason I’m still here is so I could scroll through and add this comment. Thanks for giving this piece of advice. we are following some old design tactics which I think is hampering our growth. Thanks For realising. Brilliant advice, as always! Thanks you, Andy.